Posted on November 12, 2014	by Katy K.
While I loved Peter and Wendy as a child, the book seems so dated when I went back to it as an adult. Here’s a fresh take on the idea. Hook’s Revenge by Heidi Schultz. Disney-Hyperion, 2014. 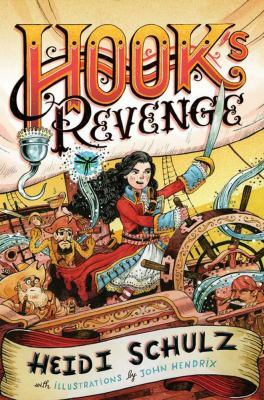 Jocelyn Hook, daughter of the famous Captain James Hook, has been raised by her grandfather, who suddenly sends her off to finishing school to mend her wild ways. She finds the pink ruffled bedrooms and strict emphasis on grooming and etiquette stifling, but soon makes friends with Roger, the brown-skinned gardening boy. Just after their friendship is discovered and Roger dismissed, she receives a message by raven from Edgar Allen’s Mainland Delivery service: her father has been murdered. Immediately, she sets off to Never Land to reassemble Hook’s pirate crew and defeat the enormous crocodile that ate her father. She might teach that obnoxious flying boy a lesson or two as well. Filled with encounters with mermaids, cannibals and grown-up Lost Boys, this is a rollicking adventure fun both for readers of the original as well as new ones. Jocelyn is a great character. While J.M. Barrie’s Never Land is justifiably beloved, his glorification of the feminine as mother feels misplaced now. Jocelyn openly refuses to play to either of the accepted roles for women of her time – she’s openly scornful of both romance and playing the role of mother to anyone, whether Lost Boys or pirates. She’s resourceful enough to hold onto her identity as a proud pirate even at finishing school and then use lessons learned there in Never Land. I loved the loyal friendship between Jocelyn and Roger, refusing to bend towards romance. The pirates, including Mr. Smee, all felt appropriate as caricatures. Unfortunately, one of the most problematic elements of the original Peter Pan, its treatment of the Natives, remains. Here, the natives have bright feathers coming out of their nostrils that I guessed were meant to make them feel less human and therefore not need to be treated politely. They are cannibals, set to eat Jocelyn for dinner. While the scene where she rescues herself is amusing, it doesn’t at excuse a modern book repeating and amplifying the racism of the past. This is a small scene in a book that otherwise does very well at correcting the egregiously offensive things in Never Land. It’s troublesome enough that I wouldn’t just hand it to my own child, but there are enough good parts to the book that I would consider reading it together with lots of discussion on the topic. I’d also recommend Dave Barry and Ridley Pearson’s Peter and the Starcatchers for young Peter Pan fans. This entry was posted in Books and tagged Peter Pan, pirates, youth fantasy. Bookmark the permalink.